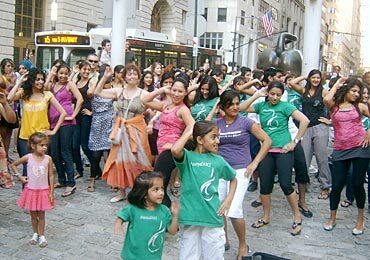 Aseem Chhabra witnessed a flash mob Bollywood dance on the streets of New York over the weekend, where people started swinging to Sheila ki Jawani among others. He shares his experience. The crowds starting gathering around 5.30 pm. By 6 pm, there were a couple hundred people, mostly desis, who were hanging inside and around the small Bowling Green Park positioned right in the middle of downtown New York's Museum of American Indian and the giant Charging Bull sculpture that once represented America's financial might. As the drums continued to beat, the two were joined by their dance instructor colleagues from the Dhoonya Dance company in New York City. 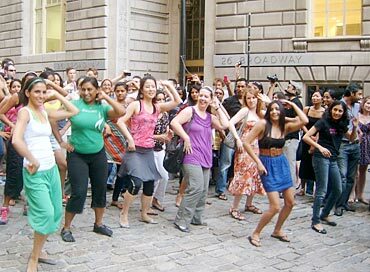 The dancers were mostly women, and South Asian, but very energised despite the heat in New York City. It was late Saturday afternoon, the sun still shining and downtown New York was buzzing with the one bright element of Farah Khan's film Tees Maas Khan. 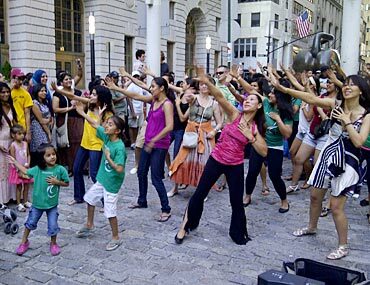 This was New York City's first Bollywood Flash Mob event. The e-mails had started going out early last week and as is common in Flash Mob events, people forwarded them to their friends. The e-mail went viral along with the YouTube link giving people step-by-step instructions on how to dance at the event, first to Sheila Ki Jawani, followed by I Hate You, Like I Love You from Delhi Belly. Avani Shah and her friend Mehal Shah practiced the dance together in their living room, watching the instructions on their laptop. "Everyone loves Bollywood dancing," Avani said. Mehal added: "I thought it will be a fun thing to do. This is the first time I am participating." Anisha Jhevari heard about the event from her sister, who had received an e-mail from a friend. "So we got the link and we have been watching the tutorial and learning the dance all week," she said. Her friend Aarti Virani added that they practiced on their own mostly to Sheila Ki Jawani. "Initially, we thought we would only do one," she said. "I Hate You has more guy oriented moves. But we don't want to mess up the mob." "We were looking for a place that would be intimate, but also reflects the essence of New York," said Dhoonya's co-owner Priya, when asked about the choice of the location. She runs dance companies operations out of New York City. "We thought hopefully the financial district and the bull should bring good luck." Her colleague Kajal heads Dhoonya's dance business out of Washington DC. The steps to the Flash Mob event were choreographed by Kajal. "We selected Sheila because our students love the song. The second one is a new song and already a big hit. So we wanted to use something that's new but not your common Bollywood song. It's a little funny, a little silly and it will work well in the five minute routine," she said. Following the two songs routine, the Kajal and Priya offered free dance instructions and were joined by many other people who were standing in the side and watching, bitten by the Bollywood dance bug.